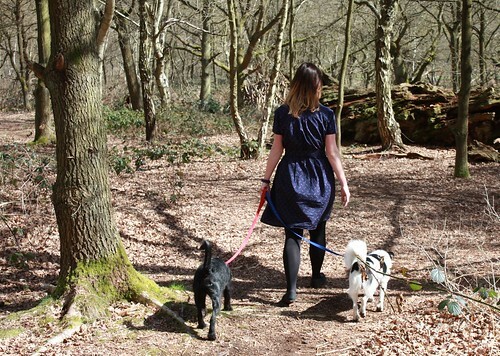 There’s little point in beating around the bush: my B dress – my Bows and Arrows Dress – is my favourite garment made to date. I’ve hinted about this make for the past couple of months, as it was made (soon) after the Yorkshire Spoolettes meet, using fabric purchased from Fabworks in Dewsbury. 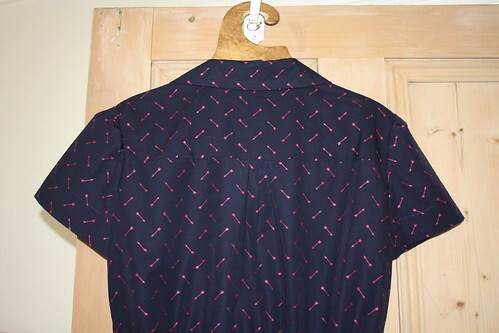 It was love at first glimpse, I liked the print, the colour way, the price (£6pm I believe) and I liked it all even more so when I saw the arrows were stitched and not printed. 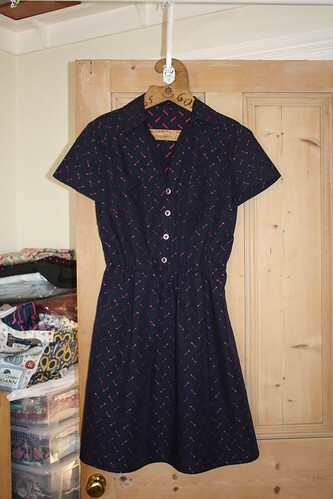 An aim for this year is to improve my technique and skill base, so I chose a Newlook shirt dress pattern (6180), which I had cut out on paper away in Northumberland LAST Easter, eek. 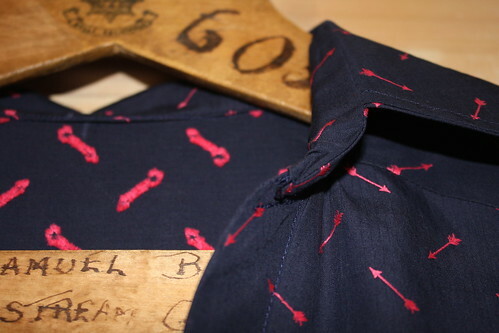 Collars, breast pockets, buttons and button holes…there was lots to get my head around with this make, and it certainly wouldn’t be a quick fix. I took a deep breath and resolved to being in it for the long haul. 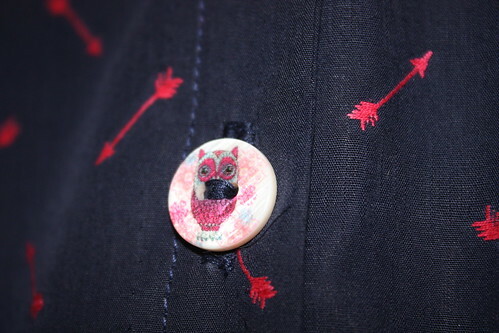 I chose some buttons from my stash with little owls – not relevant to the print or style of dress but a good colour match for the arrows, I felt. I made the optional tie belt but didn’t alter the pattern at all (that’s still pretty much beyond me). Thinking back, the collar and neckband came together fairly well, considering. I think I had to add a few stitches to secure the edges but it looks pretty ok. It was a more time consuming make than I usually go for, but I think the detail and style of the end product justify this investment. In short, I love it! The length, the style, the fabric, the buttons, everything! 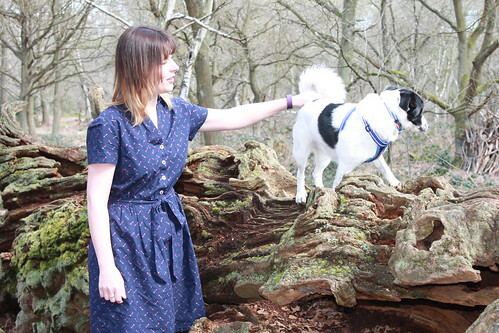 And where better to go for my Bows and Arrows Dress than Sherwood Forest? 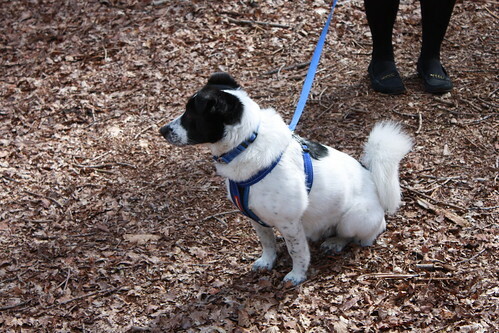 Of course, I interwove photos with a dog walk. Nice dress! I agree, the embroidered arrows better than printed, and your top stitching looks spot on! Ahh that’s really nice. I got about a metre of this myself out the remnant bin ages ago and have just used a bit for a contrast on the lapel of a blazer. I agree it’s lovely quality, I’m just wondering what to do with the rest of it now! Thank you. Contrast lapels sound great! Could you squeeze a sleeveless top from the remainder? Thank you Sheila – you’re right, quality makes all the difference, including making me care more about achieving a better finish. Lovely dress & good for you for tackling so many details! I love a good shirt dress and this one looks great. Thank you! 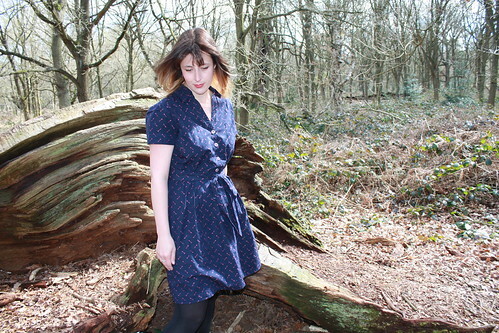 I still have another couple of shirt dress patterns to try – they are so wearable aren’t they?! Yes, I would have gone on to make this one straight away too. You always know when you find a great pattern that suits you. This dress looks great on you. Very cute! I love the fabric and that shirt dress style – a classic! Thank you – yes it’s such a flattering style isn’t it? Lovely Camilla! That fabric was a great spot and works perfectly for this dress. Can see why you’ve already managed to wear it so much, looks dressy but not too dressy. Great job! Thank you Teresa 😊 I found another gorgeous fabric in a similar spot in Fabworks, right by the front door but tucked behind another bolt – definitely an area to check out! Lovely dress, shirtdresses are so easy to wear and sewing them can be come addictive! It’s a decent pattern which I think looks much nicer made up than it does on the pattern envelope!